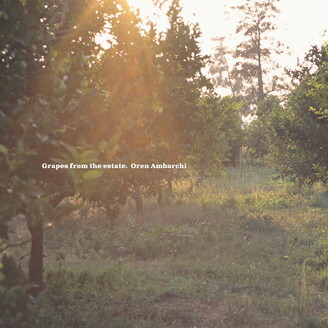 Black Truffle is pleased to make Oren Ambarchi’s Grapes from The Estate available once more on vinyl. Originally released on CD on Touch in 2004 and reissued on Southern Lord as a limited double LP in 2006 during Ambarchi’s tenure as a member of Sunn O))), Grapes from the Estate was a landmark release for Ambarchi, seeing him expand his sonic palette beyond the clipped, bass-heavy electric guitar tones he was known for at that point. Incorporating subtle layers of strings, keyboards, percussion over a bedrock of his signature guitar tones, in retrospect this album can be seen as the beginning of a broadening and evolution in Ambarchi’s work that would lead to his acclaimed, densely layered epics for Editions Mego, Quixotism (2014) and Hubris (2016). Beginning with the shuddering pure tones of opener ‘Corkscrew’, which looks back to previous guitar-only releases such as Suspension (2001), the album’s next two pieces show a progressive broadening of the instrumental palette and a corresponding move away from textural abstraction and sustained tones towards more traditional notions of musicality. This reached its high point on the album’s third piece, the fifteen-minute long ‘Remedios The Beauty’, where guitars, both acoustic and electric, strings, piano, and bells build from a murmur to an interlockinging web of repeating melodic patterns over gently swinging brushed snare and cymbals. The epic closer, ‘Stars Aligned, Webs Spun’, returns us to a space populated only by the electric guitar, but unlike everything Ambarchi had produced up until this point in his career, the piece has a liquid, psychedelic edge that looks forward to the shimmering harmonics of his more recent work. As Brendan Walls wrote at the time of the original release, this is ‘another outpouring of personal, intimate and enduring music from Oren Ambarchi’. Presented in a stunning gatefold sleeve featuring the original artwork and design by Jon Wozencroft. Redesigned by Stephen O’Malley Remastered and cut by Rashad Becker at D&M, Berlin.